Imrímid peil gaelach, iománaíocht agus camógaíocht sa scoil. Sa chéad téarma, tosaímid leis an bpeil agus déanann na buachaillí agus cailíní traenáil tar éis am scoile uair amháin in aghaidh na seachtaine. Eagraíonn Cumann na mBunscol cluichí dúinn agus bíonn 3 fhoireann againn ag glacadh páirt sna comórtais seo gach bliain. Bíonn foireann na mbuachaillí sóisear, foireann na mbuachaillí sinsear agus foireann na gcailíní ann. I mbliana, bhí níos mó ná 60 páiste ag traenáil linn gach seachtain. I Samhain 2016, d’éirigh leis na buachaillí sínsear an cluiche ceannais a bhaint amach agus a bhuachaint i bPáirc an Chrócaigh. D’éirigh le foireann peile na gcailíní an éacht céanna a bhaint amach i 2015. I mí Feabhra nó Márta, tosaímid ag déanamh traenáil iománaíochta agus traenáil camógaíochta leis na buachaillí agus na cailíní. Mar an gcéanna leis an bpeil, bíonn 3 fhoireann ag glacadh páirt i gcluichí Cumann na mBunscol. Chomh maith leis sin, eagraíonn na Sairséalaigh i Leamhcán blitzchomórtais do na scoileanna áitiúla gach bliain agus imríonn na páistí go leor cluichí. Tagann cóitseálaí isteach ó CLG na Sairséalaigh go rialta chun scileanna iománaíochta agus scileanna peile a mhúineadh do na páistí sna bunranganna. I 2016, thosaigh cóitseálaithe ó na Gaeil Óga, CLG nua áitiúil, ag teacht isteach sa scoil chun scileanna cluichí gaelacha a mhúineadh do na páistí. Tá an t-ádh linn go bhfuil dhá chlub CLG ann sa cheantar dár bpáistí. We play Gaelic football, hurling and camogie in the school. In the first term, we begin with the Gaelic football and the boys and girls train once a week. Cumann na mBunscol organise games for us and we have 3 teams playing in these competitions every year. We have a boys’ junior team, a boys’ senior team and a girls senior team. This year, more than 60 children were training each week. 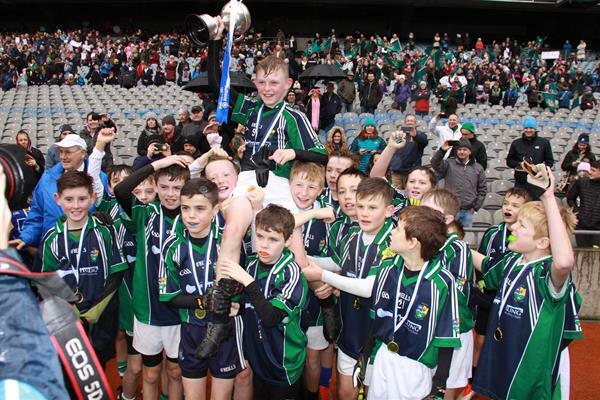 In November 2016, the boys’ senior team managed to qualify for, and win, the final in Croke Park. The girls’ team achieved this same feat in 2015. In February or March, we begin hurling and camogie training with the boys and girls. As with the football, we have 3 teams taking part in Cumann na mBunscol games. Added to that, Lucan Sarsfields GAA club organise blitz completions for all local schools every year and the children play plenty of games. A coach or Games Promotion Officer from Lucan Sarsfields comes to the school regularly throughout the school year and teaches the skills of hurling and football to the children in the junior classes. In 2016, coaches from Na Gaeil Óga, a new local GAA club, started coaching the skills of Gaelic games to the children. We are lucky to have two GAA clubs in the locality for our children.